Planning a Texas vacation getaway? 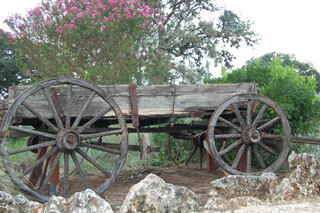 Located just southwest of Austin, the Bear Creek Retreat offers a perfect locale to rest and unwind. The spacious two story house is yours to enjoy as you relax amongst hundreds of acres of scenic Texas hill country. Each of the 3 bedrooms in the house have a unique character, from the Emporer's Room (with a Texas sized bed said to be the largest in the state), the Wildflower Room, and the Americana Room. 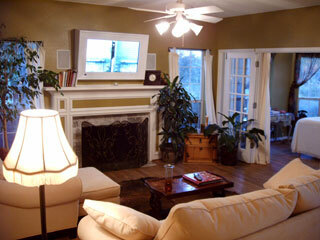 In the living room, a bear rug covers the wood floor in front of a framed plasma TV situated above the fireplace. A side room includes a professional massage table where licensed therapeutic massages can be arranged, with advance notice. The front porch that wraps around the house has plenty of room for friends and family to sit and relax. In the hallway underneath the stairs we discovered a fun kids room with toys and drawings on the walls. As I explored the well landscaped grounds, a pair of hummingbirds whirred by around my head as if to welcome me on their way to visit some Texas sage. I was drawn to a rustic wagon, next to an old water tower and pump. A nearby 6-10 mile hike/bike trail winds its way around the property, and bicycles are available for use free upon request. 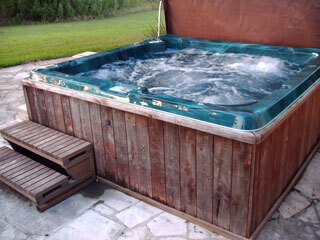 After a long walk, you will be ready to treat yourself to a therapeutic massage and soak in the large hot tub located behind the house. A BQ grill is nearby if you want to put some steaks on. A swimming pool is located just behind the owner's house next door. There is a large kitchen which includes a stove, microwave, toaster, coffee maker with coffee, refrigerator, and all accessories so that you can bring your own food to cook if you want (or have it prepared for an added fee). There are also complimentary snacks and beverages for guests, including your very own jar of out-of-this-world homemade hot fudge that is perfect when heated and drizzled over some ice cream to enjoy while you soak in the hot tub. Breakfast, lunch, and dinner meals can be provided for a nominal fee. Breakfast can be Mexican style with Migas and homemade salsa or a gourmet fruit platter and homemade carrot cake muffins with chopped pecans. The location of Bear Creek Retreat is conveniently near the live music capital of Austin, but far enough away to where you only hear crickets at night. The Ladybird Johnson Wildflower Center is just a few miles away. Pets are allowed, with advance notice. Check in time is 3.00 pm and check out time is 12.00 noon. True to it's name, this B&B is a true retreat. 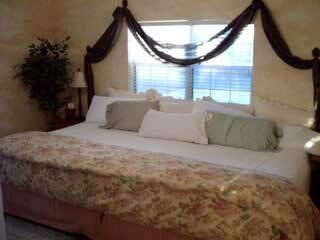 The location is perfect for family, friend, or romantic getaways, small reunions, and weddings. We would like to thank Caroline for assisting with our feature. Exit at Slaughter Lane and go left (east). Turn right onto Brodie Lane till it ends, then turn right on FM 1626. At the first light, turn right onto Bliss Spillar Road and drive 1.3 miles and turn left to Carpenter Lane. Drive one mile, and you will see an open orange gate. Drive up the hill and Bear Creek Retreat is the blue house on the right. Exit at Onion Creek Parkway/FM 1626 (#225). Drive along the Frontage Road and then turn right onto FM 1626. Travel 3.8 miles west on FM 1626 and then turn right onto Bliss Spillar Road. Drive 1.3 miles then turn left on Carpenter Lane, going one mile to the end of the road. Drive one mile, and you will see an open orange gate. Drive up the hill and Bear Creek Retreat is the blue house on the right. Exit at Slaughter Creek Overpass and then turn left (going west) over the highway bridge, then turn left onto the access road. Turn right onto FM 1626 and head west until you reach Bliss Spiller Road (the 5th light) and turn right. Drive 1.3 miles, then turn onto Carpenter Lane. Drive one mile, and you will see an open orange gate. Drive up the hill and Bear Creek Retreat is the blue house on the right.